AirDropsDAC announces a partnership with Metal Packaging Token to airdrop MPT! CHICAGO, March 25, 2019 — AirDropsDac announced today that it has entered into a partnership with Metal Packaging Token to airdrop MPT. Metal Packaging Token is a Blockchain-based solution to improve cost-effectiveness within the metal packaging industry. Every product that we use in our daily lives requires some type of packaging and every product can have more than one packaging solution. Common packaging solutions include metal, glass, paper, and plastic. Of these, only metal and glass are 100% recyclable without any loss in purity or quality. Selection of a packaging solution is many times influenced by its cost and industry lobbyists, rather than by its impact on the environment. Plastic pollution, as we all know, is threatening the very survival of our planet. MPT’s goal is to stimulate the world’s Metal Packaging Industry. Absolutely every product that can be packed in metal containers should be packed in metal containers and MPT intends to achieve just that! Metal Packaging Token aims to build can recycling machines to be strategically placed at MPT deposit points and to develop an MPT mobile app to be used by end consumers. People are incentivized to return metal cans to MPT deposit points and earn MPT as a reward. The founders of Metal Packaging Token, Carlos Cabanelas, and Peter Schoonwagen have extensive experience and contacts within the meta packaging industry. MPT has a maximum supply of 1.8 Billion. Of this, 50% is being airdropped to EOS account holders at a 1:1 ratio up to a max of 500,000 MPT per account. The snapshot for this airdrop was taken on the 15th of March, 2019. All EOS accounts with a balance above 0 are eligible for this airdrop. We are using a hybrid model to airdrop MPT. 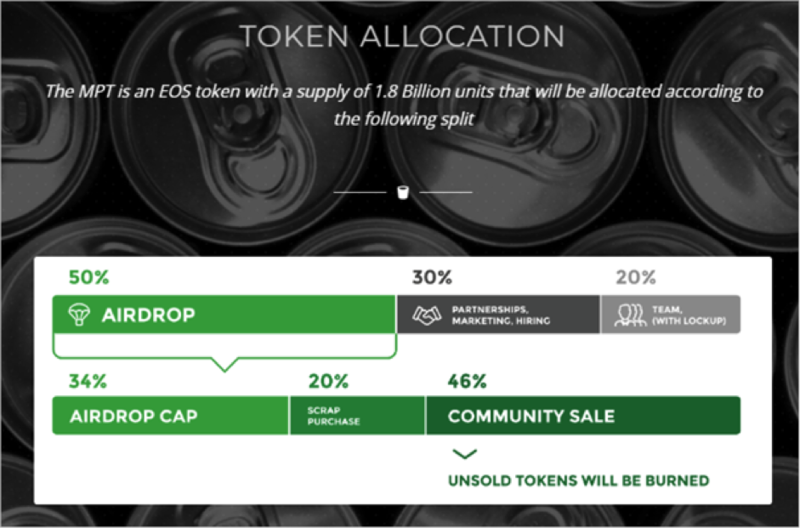 In the first round, MPT is airdropped to all EOS account holders using our claimable token model. This airdrop needs to be claimed within a 6 week period. All unclaimed tokens will be reclaimed in the first week of May. This will be followed by vAirdrop using vRAM. AirDropsDAC as a DAPP Service Provider (DSP) offers vAirdrop using vRAM developed by LiquidApps. vRAM is a paging mechanism for accessing the indexed data stored on IPFS by the DSPs. With vRAM, data from the chain history is made available to contracts in RAM on demand. vAirdrop does not require mainnet RAM and therefore there is no reclaim with this. If you missed claiming MPT within the 6 week period, you can always claim the MPT vAirdrop at a later date. The claim process for the first airdrop is similar to our previous claimable airdrops such as ZKS and EMT. You can claim the tokens through our portal or by transferring the token to another account. MPT can also be claimed through EOS Discussions. You can login to EOS Discussions and leave a small MPT tip to claim your tokens. Video instructions regarding this will be posted later. vAirdrop can only be claimed through our portal. EOS Discussions hosts community-powered discussions covering everything in the EOS ecosystem. AirDropsDAC offers full-range of airdrop services. From token smart contract design and creation to managing the resources needed for an airdrop such as RAM and CPU, as well as taking care of all the details that go into conducting a successful airdrop. AirDropsDAC also offers services as a DAPP Service Provider (DSP) on the EOS Mainnet. AirDropsDAC intends on making the development of DAPPs more affordable, efficient and scalable through its DSP packages.